Demimonde (French for "half-world") is a polite 19th century term that was often used the same way we use the term "mistress" today. In the 19th century, however, it primarily referred to a class of women on the fringes of respectable society supported by wealthy lovers (usually each had several). The term is also used to refer to these women as a group, and the social circles they moved in. As a group, the demimonde did not form a 'society', per-se, any more than modern prostitutes form a society. However, they did represent a specific class of women in the latter half of the 19th century and into the early 20th century who, though not respectable, were commonplace fixtures in the upper class of French, English and, to some extent, American society. 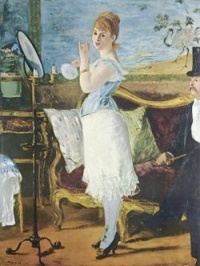 In the United States and Britain, they were (and still are) also often referred to as courtesans, though the term courtesan in the 19th century applied to a profession (as the term "prostitute" describes a profession), whereas Demimonde/Demimondaine was used to describe a broader social class of persons. The term is French, and means literally "half-world", implying those women existed on the fringes of the "World" (in the sense of fashionable society). It derives from a comedy by Alexandre Dumas fils published in 1855 called Le Demi-Monde. Descriptions of the fictional demimondes can be found in Vanity Fair, a novel which satirizes 19th century society written by William Makepeace Thackeray. Although the terms 'demimonde' and 'demimondaine' do not appear in the work (the term had not been coined at the time of the writing), the term was used by reviewers and other authors following the release of the novel in reference to three characters within it. The characters of Lady Crackenbury and Mrs. Washington White are demimonde characters, both of whom Captain Rawdon Crawley lusts after in his younger days. Prior to her presentation in court, Becky Sharp is perceived as being a demimondaine, and she later becomes one in fact during her travels through Europe following her abandonment by her husband. Colette's Gigi also describes the demimonde and their lifestyle. Gigi is schooled from childhood to be a kept woman, to stifle her feelings in return for a life of ease. "We never marry in our family", says Gigi's mother. But Gigi finds herself a misfit in the demimonde of Paris in the 'Gay Nineties', as she desires true romance with Gaston. Externally, the defining aspects of the demimonde were an extravagant lifestyle of fine food and fine clothes, easily surpassing that of most other wealthy women of their day, simply because of the steady income they made in both cash and gifts from their various lovers. Internally, however, their lifestyle was an eclectic mixture of sharp business acumen, social skills, and simple hedonism. Smart demimondaine, like the fictional Gigi's grandmother, invested their wealth for the day when their beauty would finally fade. Others ended up penniless and starving when age finally took its toll on their beauty unless they managed to marry one of their lovers. Of real-life demimonde, the most famous was arguably Cora Pearl. As the 20th century dawned, evolving social mores regarding women's place in society (particularly the suffragette and flapper movements) caused the demimonde to fade. The term then became commonly used to refer to the class of 'starving artists' - painters, authors, poets and other pseudo-bohemian types - who were marginalized by their failure to succeed financially. Unless indicated otherwise, the text in this article is either based on Wikipedia article "Demimonde" or another language Wikipedia page thereof used under the terms of the GNU Free Documentation License; or on original research by Jahsonic and friends. See Art and Popular Culture's copyright notice. This page was last modified 13:33, 27 December 2013.